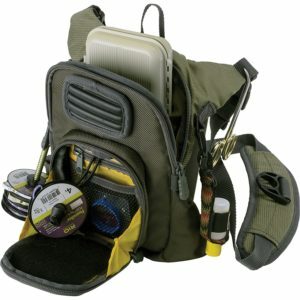 With an uncountable amount of offers it can be hard to find the best fly fishing chest pack for your situation. Every pack comes with different features and to sort out what you really need and what is just fancy marketing talk can be time consuming. 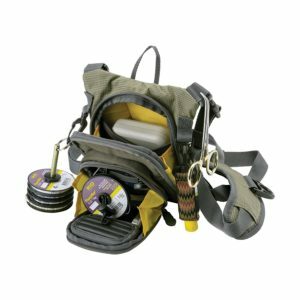 Wadinglab presents you our 4 top rated fly fishing chest packs on the market combined with quick reviews and helpful information. Save yourself time and money and let us help you choose the best chest pack for fly fishing. While fly fishing there are a few basic tools you don’t want to miss in any situation. Since you obviously can’t carry them in your hands the whole time there are a few different methods how people store their essentials, while standing in the river. 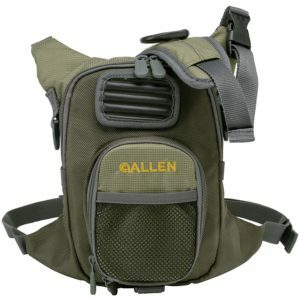 A really popular choice, that slowly replaces classic fly fishing vests for a lot of people are specially designed chest packs. They are lightweight come in all different sizes and shapes and are incredibly handy. Everything you might need while wading through the wet can be stored in them. A fly-box, a nipper, pliers, leader, tippet, you name it. 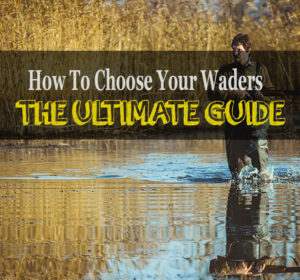 Some even offer enough room for a wading staff. The best fly fishing chest packs don’t limit your movement and once you get used to them you might even forget that you wear them at all. As stated earlier, you could spend hours looking at all the chest packs and there different features. According to the manufacturer’s every one of them offers something that is absolutely indispensable for fly fishing and if you take all of it seriously, you might see yourself wondering how you even fished without one before. Yeah, that’s marketing and that’s what many companies spend a fair amount of the price you pay for their product on. If you couldn’t care less about the “image” the brand has you are using, you should look for a product where you pay for value instead of a fancy brand. You should focus on a few main aspects the best fly fishing chest pack should provide, besides those everything else is luxury. With all the different sizes and forms those chest packs are available in, it’s hard to say what’s too heavy. Think about what you want to pack in yours and choose an appropriate size. Logically bigger packs are heavier and tend to get more in your range of movement. Generally you should go as small as you possibly can, while still having enough room for all the necessities. There is no point in getting a fly fishing chest pack that has enough room for your entire equipment but is uncomfortable and bulky, so you end up leaving it at the river bank using your pockets again. 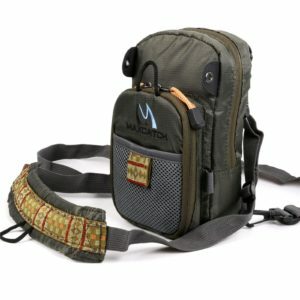 In times where slim but sturdy materials like nylon are used for most fly fishing chest pack you should be able to find yourself a pack that you actually enjoy wearing. Storage to Size/ Weight Ratio is key! Packed up a good chest pack for fly fishing takes barely more room than the equipment itself. In addition to pockets and inside storage most fly fishing packs offer d-rings and loops on the outside which lets you attach equipment you will use more often, like nippers or pliers. In addition to that it also gives you the chance to use tippet bars which are specially designed holders attachable to such loops and rings. Most holders enable you to pull out the right amount of line without even touching the role, definitely a big plus once you get used to it. 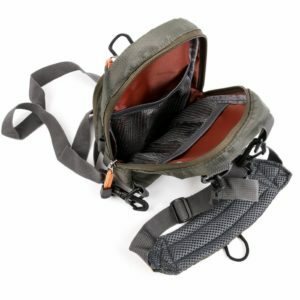 Wadinglab presents our selection of the best fly fishing chest packs on the market. Reading those short reviews should give you an idea what’s the right choice for you and no matter which one of those four you pick, you can’t really go wrong with them. They are ordered by size, starting with the smallest and ending with a great fly fishing day pack, which offers plenty of room. The smallest chest pack on this list, the Bear Creek Micro offers a surprisingly high amount of storage possibilities. Made from nylon and with a weight of 3 ounces this pack is targeted towards fly fishers that like to carry only necessities. You won’t be able to fit your wading staff in there but a decently sized fly box will and besides that you have countless possibilities to attach leader holders, nippers and pliers on the outside. The big pocket won’t open completely which lowers the chance of losing all it’s contents to the river, by accidently opening it too far. A small bilateral nylon fabric on both sides assures that nothing can slip out unnoticed. On the inside you will find a nylon mesh, closable with a zipper, designed to contain small but essential stuff like weights or whatever you need while fishing in addition to another separated department, where you would tuck in your fly box. The second and smaller pocket is about half the size of a the big one and comes with another mesh compartment and a rubber cord where you can line up leader and tippet roles. Again you will find bilateral nylon fabric to prevent the pocket from opening completely. On the frontside the Bear Creek Micro provides another rubber supported mesh pocket with a modified d-ring on the bottom side. Said d-ring can also be found on both sides of the pack as well as on the cushioned and adjustable straps. The d-ring on the neck works for attaching a landing net. The fitting is just great. It sits tightly on your body, nothing wiggles and once correctly adjusted, you will barely notice the straps. In terms of comfort it beats everything in this price range, but logically the size plays heavily into that. If you prefer to fly fish with only the necessities and look for something to store those perfectly, while not limiting your movement in any way, the Bear Creek Micro is a great choice. It’s a small and handy fly fishing chest pack, suitable for fishers that might try to get back to the roots of fly fishing, maybe even with Tenkara. Another fly fishing chest pack made by Allen, this time a little larger and also definitely more suitable for a day trip than their micro one. While the front pocket is similar, if not exactly the same size, the second and bigger pocket beats the Bear Creek Micro by far in terms of storage. Besides that the bigger brother also offers almost the same features and if you break it down to only the differences, it’s mainly size. The bigger pocket offers mesh compartments on both sides, one is closable with a zipper and the other one has an open upper side, which makes it the perfect place to store a fly box safely. Do not underestimate how much bigger this pocket is, compared to the Micro version. It’s more than double the size and even my biggest fly box would easily fit in there. The smaller pocket comes in exactly the same design: small mesh compartment, a little zipper pocket (inside the zipper pocket) for stuff life car keys or similar and a rubber cord where you could attach tippet and leader roles. You will also find d-rings placed in the same positions as on the Micro version. Bilateral for tipper and leader holder (or to attach a nipper on a line) and the classic d-ring on the padded neck strap that works perfectly for attaching a landing net. As said earlier this fly fishing chest back is basically the bigger brother of the Bear Creek Micro. If you need the extra size, maybe because your fishing destination is full of picky fish, requiring a larger selection of flies, or any other reason, this pack is the way to go. During reasonable use there is probably no way of breaking it and for $30 you get yourself a fishing companion that will be around for quite a few seasons fly fishing. The next pack on this list is again noticeably bigger and offers enough room even for things you might not need during your average fishing session. Since it’s made from nylon it barely weighs 8 ounces while still providing two pretty big pockets. The bigger pocket comes with mesh compartments on both sides, letting you store at least a couple roles of leader and tippet and between those two sides there is still plenty of room. If you would want to, you could fit a big fly box AND a reel in there. Even if you open the zipper completely, the design makes sure that the front part doesn’t drop down to far. Similar to the Allen Micro this can make the difference between reaching everything you need comfortably and spreading all your loved equipment into the fast flowing river. The second pocket is actually not really a pocket and works more as a storage compartment for flies. A form layout, which performs exactly as the inside of a fly fishing box, lets you store plenty of flies and might even convince you to leave one of your fly boxes at home. Two orange nylon strings prevent the compartment from emptying itself, since the zipper opens almost all around to provide a small work-station. The third storage option can be found on the frontside in form of an additional mesh compartment. There are quite a few loops all around the pack giving you the chance to attach tippet bars, nippers, pliers or anything else you want to reach quickly. The straps are fully adjustable and the neck strap is padded with a mesh, supposed to prevent sweating. During the first couple uses it might be a little scratchy but after a few days of fishing you won’t notice the strap anymore. On the same strap you will find a loop where you can attach a landing net. A d-ring would have been nicer and more sturdy but a loop does the trick as well. Tend to carry a little more equipment around? This fly fishing chest pack got you covered. For a price as low as $20 you won’t find an option that provides that much storage. A perfect pack for someone taking day trips which require a little more equipment or even a small box of food. It’s challenging to fill up this pack without packing stuff you don’t really need. 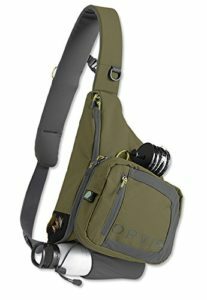 Last but not least on this list we decided to include the popular Orvis sling pack. Yes it’s not really a classic fly fishing chest pack, but serves the same purpose and is definitely worth considering, if you are looking something in this direction. It might be a little pricey compared to all the other options but it offers a broader set of features that definitely make sense in some situations. In addition to that, for some people the classic neck strap might feel uncomfortable and a shoulder sling tends to distribute the weight in such a way, that you barely notice the pack. The design used here also moves the whole pack onto your back when not in use, which is great if you feel a chest pack limits your movement too much. The bag itself is made from 410-denier nylon with a special coating along the bottom of the back, making it more water resistant. This coating works like GORE-TEX or other durable water repellent treatments, that remove any chance for water to enter the fabric. The back panel works as a separation between your body and the nylon fabric, which lets you wear the pack tightly without getting uncomfortable or sweaty in that area. The main pocket is just huge! It offers easily enough room for all the essentials, a few fly boxes and a reel, this pack is by far the one with the biggest storage capabilities. If this isn’t enough space for you, you should rather look for a big backpack instead of a fly fishing sling bag. The smaller front pocket is still pretty big and is around the size of the whole Allen Micro version. Food, a fly-box, your smartphone (better get an additional small waterproof plastic bag here) or whatever else you could come up with, the Safe Passage Sling Pack offers plenty of room. As all the fly fishing chest packs on this list, you will find a small slash pocket in the front which is the perfect place to store your keys safely. The last pocket is the water bottle pocket. Fly fishing can be more exhausting that you would think and especially on a sunny and hot day, staying hydrated is best practice. This pocket holds most of the common sized drinking bottles and once you tightened the rubber cord, you don’t have to worry about your bottle falling out. On the other side of the back you have the chance to attach a tippet bar. The shoulder sling is padded as well and as mentioned earlier, you will barely feel the weight you are carrying, once you adjusted all straps correctly. In addition to the shoulder strap you have a another strap which goes from the back right under your arm and clicks into the front panel. If this strap is attached, your sling pack will hold onto your back and is completely out of the range of your movement. Once you open said strap you can pull the pack to the front and access everything comfortably. Another really handy feature attached to the sling is a pocket designed to hold your pliers letting you reach them in seconds. Being the most expensive, but also by far the fly fishing gear bag with the most room on this list, the Safe Passage is perfectly designed for day trips, where you might need to pack a little more than usually. It easily replaces a small backpack and with all the useful features and its perfect design, there is no day pack that I would prefer wearing to this one. Once the messenger strap is locked, you will completely forget that you carry all of your equipment on your back and your casting technique won’t be affected at all. Definitely worth the money and it’s obvious why this pack is so popular. Next to a nice pair of shades and a landing net, a good chest pack for fly fishing is definitely a great accessory out on the river. 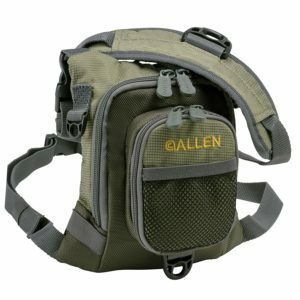 From small to big this list of the best fly fishing chest packs should provide an option for everyone and considering that all of them are reasonable priced for what they offer, you can’t really go wrong here. Getting one of those will assure that you have all the tools and equipment you need right on hand, which lets you focus completely on the fish around you. Was about to buy a cheap fly fishing chest pack at Walmart and luckily decided to have a quick look online. Never would I have thought that you could get one like those for 30 bucks. I have used the last 2 packs for over a year. I love them both. The Maxcatch pack is unobtrusive, well made and a great value. I have 2. I keep one rigged for the flats and one for freshwater. My grandkids get them for Christmas with their first fly rods.